Small-town feel with BIG opportunities. Farmington, Maine (pop. 7,500) is conveniently located in the foothills of Maine’s western lakes and mountains region. It’s world famous as the birthplace of Chester Greenwood, inventor of the earmuff, and the hometown of Seth Wescott, two-time Olympic Gold Medalist in the Snowboard Cross. 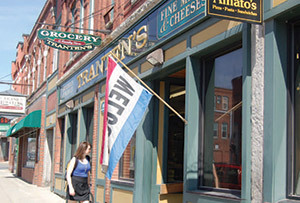 Downtown Farmington is one of Maine’s best preserved downtowns with its walkable Main and Broadway streets offering a variety of services, quaint shops, unique eateries and entertainment all available with one-stop parking. Located within the downtown is the University of Maine at Farmington, which provides an abundance of cultural opportunities and athletic events. Close to three major ski resorts and located in the midst of numerous lakes and rivers, Farmington’s location and four-season offerings make it an ideal location to establish a business. Our recent expansion into downtown Farmington is proving to be quite a successful venture since we’re nestled in between a variety of established businesses and the nearby University. From the very start, we’ve felt both welcomed and supported in the local community. Downtown Farmington’s creative heritage is evident in stores like The Chickadee’s Nest, Mainestone Jewelry, Forest Rythms, Trask Jewelers and SugarWood Gallery. Collectively, they represent over 100 individual artisans who produce high-quality one-of-a-kind pottery, jewelry, furniture and accessories. Our diverse customer base covers 44 states and nine foreign countries. 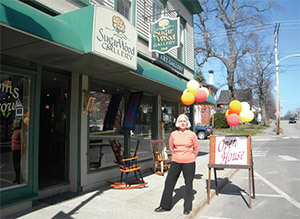 Residents from every major town in New England have found their way to Farmington and SugarWood Gallery. 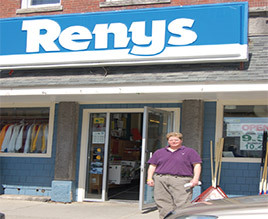 Out of the many downtown stores in the Renys chain, Farmington's is one of the most vibrant and diversified. Our proximity to the ski areas, the University, and a good mix of businesses brings vast opportunities to our business. Planning to locate your business in Downtown Farmington? At Greater Franklin Development Corporation, located in the heart of Downtown Farmington, Executive Director Alison Hagerstrom is ready to work diligently to find the building space that is right for your business. Greater Franklin maintains a database of vacancy information which includes square footage, rental rates, parking availability, utilities, amenities and much more. With a mission to provide the community with goods and services which support a vibrant local economy, the Farmington Downtown Association collaborates with Greater Franklin to make it easy for you to bring your business to Downtown Farmington. Contact Alison at 207-778-5887 or email ahagerstrom@greaterfranklin.com. Farmington has a low-interest Revolving Loan Fund (RLF) available to businesses located within Farmington, which is intended for business start-ups, upgrades, and expansions. Loan proceeds may be used for various purposes and needs, such as equipment, real estate, and working capital. Applicants must have complementary sources of financing and equity to be eligible. Loans from the RLF may not exceed $25,000, the term may not exceed ten years, and the interest rate is 5% fixed. The RLF is administered by the Code Office and applications are reviewed by a five-member Loan Review Board. To apply, contact the Code Office at 207-778-5874 or ceo@farmington-maine.org. FAME offers a variety of financial assistance options for businesses of all sizes. 207-623-3263 or business@famemaine.com. Development Center SBDC offers free business counseling, business planning and funding assistance services. Learn more at MaineSDBC.org. AVCOG - Contact Rose Creps at 207-783-9186. Coastal Enterprises Women's Business Center - Contact Betty Gensel at 207-778-6529. Farmington has a wide variety of lenders offering a hometown touch with big city resources. Conduct an online interview to find out what Maine licenses and permits you may need to start your business. Visit maine.gov/online/businessanswers. Starting a business in Farmington may require permits, licenses and other approvals from the Board of Selectmen, Planning Board, Sewer Department, Public Works Department, Local Plumbing Inspector (LPI) or Code Enforcement Officer (CEO), depending on the nature of the business and its location. The Code Office will assist you in determining what approvals will be needed. 153 Farmington Falls Rd., Farmington. Sewer Connection Approvals, Certain Businesses, Liquor Licenses, Special Amusement Permits, etc. Zoning – Dimensional Requirements and Performance Standards, Site Review, Subdivision, Shoreland Zoning, Floodplain Management, Soil Erosion Control & Storm Water Management, Signage, Project Registration, Certificate of Occupancy (CO), etc. 152 Public Works Dr., Farmington. For information regarding connection to the public water system, contact the Farmington Village Corporation at 207-778-4777. Q. I'm opening a restaurant. How do I apply for a victualer's and/or liquor license? A. While towns can elect to require restaurants to obtain victualer’s licenses under State law, Farmington does not require such businesses to do so. Anyone contemplating the opening of a restaurant should first contact DHHS/DHE whose agents carry out regular inspections of eateries in Farmington under the State’s Food Rules and enforce same. Fitting out a new restaurant with the equipment required by State standards is expensive, and there are also Town sewer connection fees - and requirements such as grease traps. To obtain a liquor license from the State, application must be made the Town Clerk and the Board of Selectmen must grant approval – which is renewed annually at the discretion of the Board. A new restaurant would also require Site Review approval by the Town’s Planning Board. Q. I need a sign for my business. What do I do first? A. Check with the Code Office to see what the signage requirements are for the particular zoning district your business location lies within. For instance, internally lit plastic signs are no longer allowed in the Village Business Historic District. Provide the standards for your district to your sign maker, then provide a proof of the draft design to the CEO for approval and permitting – for a nominal fee – good for the life of the sign. Q. Am I required to get a “Doing Business As” (DBA) license. Where do I go? A. While Towns can elect to require businesses to obtain DBA licenses under State law, Farmington does not require that businesses do so. However, businesses that are not incorporated as LLC, LLP, C, or S Corps may voluntarily elect to file a DBA registration form with the Town Clerk to protect their business name within the Town limits. Businesses that are incorporated through the Secretary of State’s Bureau of Corporations as LLC, LLP, C, or S Corps have their business name protected throughout the State. Additional questions? Contact Alison Hagerstrom at 207-778-5887.